Hyper metabolism is the physiological state in which the metabolic activity of body is increased and also an abnormal increase in basal metabolic rate is also seen with it. The basal metabolic rate controls functions like breathing and maintaining warmth of body. When basal metabolic rate increases, weight loss can occur sometimes. The increased body metabolism state can show some underlying issues for example fatal insomnia or hyperthyroidism. Normally hypermetabolism occurs after an injury or burn to the body. The nutritional values of the person with hypermetabolism are also disturbed and are checked regularly. The person with hyermetabolism have to suffer from anorexia as less eating will cause less energy to utilize and the system will not hyper metabolize. During the acute phase of hypermetabolism, protein synthesis occurs in liver which increases the levels of some essential proteins and decreasing the level of other proteins and this can give information about the nutritional level of patients by testing serum. The protein whose level is to be up-regulated is known as C-reactive protein. This protein can increase its serum level from 20 to 1000 folds. In hypermetabolism the carbohydrates, proteins, and triglycerides are also catalyzed to meet the high energy demand. Hypermetabolism occurs whenever there is an injury, burn or trauma. There are also some events like surgery, infections, steroid therapy and bone marrow transplants, sepsis, burns, ever, long-bone fractures, hyperthyroidism long term steroid therapy. It can occur particularly in brain after trauma or traumatic brain injury. It’s also linked to a condition called as insulin resistance. 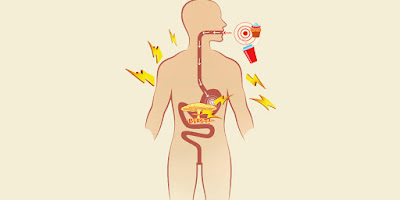 Normally, the digestive system breakdown the food into smaller sugar units and then this glucose is not controlled by insulin ( a hormone which is produced by pancreas that helps sugar entry in cell ) as a result the high metabolism takes place. • Elevated heart rate ( tachycardia ). • Increased sensitivity to heat can occur in some patients. • Increased urination due to increased metabolism. Hypermetabolism is itself a system not an independent disease. There is not any specified treatment or hypermetabolism but there are various actors which should be controlled and these factors are Blood pressure, cholesterol and blood sugar level. • Angiotensin 2 receptor blockers. • Novolog mix 70/30 .